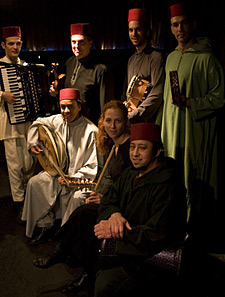 While traditional Andalusian music is hardly associated with The Museum of Modern Art, our visitors were treated to the unexpected in a beautiful, impassioned performance by Rachid Halihal and Layali El Andalus who appeared at MoMA as part of a special music series in conjunction with the exhibition, Dalí: Painting and Film. This summer event, set outdoors among the artworks, trees, and reflecting pools in The Abby Aldrich Rockefeller Sculpture Garden, took on an air of pure magic. All 300 plus seats were filled with mesmerized listeners while many others stood in rapt or danced with joy. It was a unique and unforgettable evening.